UCLA has received $1 million from mathematics professor emeritus V.S. 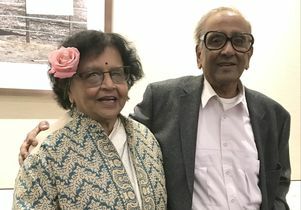 Varadarajan and his wife, Veda, to establish the Ramanujan Visiting Professorship in his home department. The new position honors renowned Indian mathematician Srinivasa Ramanujan, who made substantial contributions to mathematics in the early 1900s. The post will help UCLA attract visiting faculty members in Varadarajan’s specializations of automorphic forms, an important concept in number theory, and representation theory, which has been linked to elementary particles and quantum physics. The additional expertise will enhance UCLA’s renowned mathematics department, which U.S. News & World Report ranked among the top 10 graduate programs in the country in 2018. Varadarajan’s career included work in various areas of mathematics and physics. He taught undergraduate and graduate students; managed the Pacific Journal of Mathematics; and published nine books. Other recognition includes an honorary doctorate in physics from the University of Genova, and the Lars Onsager medal from the Norwegian University of Science and Technology for his work in mathematics. Varadarajan joined UCLA in 1965 and retired in 2014. Veda Varadarajan has her own connection to UCLA — the alumna earned her master’s degree in atmospheric sciences in 1976. The chair’s establishment is pending approval by the UCLA Academic Senate and the University of California Office of the President. The gift is part of the Centennial Campaign for UCLA, which is scheduled to conclude in December 2019 during UCLA’s 100th anniversary year.